As the government starts calling for dialogue, you may get a distinct feeling of déjà vu. After all, isn’t this the exact same thing Chávez did the last time he was looking at horrendous poll numbers? This got me thinking: what exactly came of the circus that was the Mesa de Diálogo between the government, the OAS, and the opposition held back in the halcyon days of 2003 vintage hyperpolarization? I bet our younger readers can’t even remember that far back. 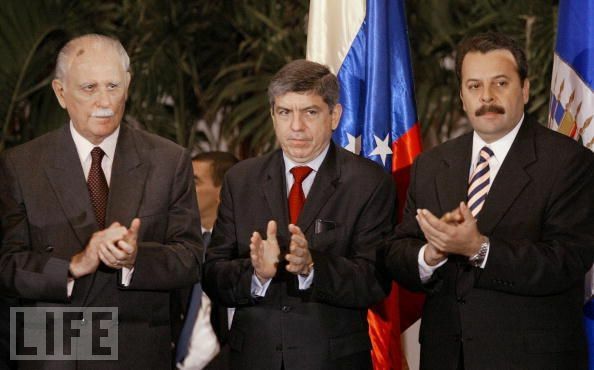 As the foggies among you will recall, getting the two warring factions to sit down and talk required the physical presence of then-OAS Secretary General Cesar Gaviria in Caracas for months on end. The end-product of this “dialogue” – one from which, it must be said, Hugo Chávez was absent – were a series of grandly verbose, horrendously boring documents that, as all schoolchildren learn, changed Venezuelan history forever, were totally forgotten from pretty much the second their ink dried. The two most significant ones were the unimpeachable “Declaration against Violence, for Peace and Democracy” (what, not puppies and bunnies too?) and the bombastically-named “Agreement Between the Representatives of the Government of the Bolivarian Republic of Venezuela and the Political and Social Factors that Support Them, and the Democratic Coordinator and the Political and Civil Society Organizations that Make it Up“, or ABRGBRVPSFSTDCPCSOMIU, as it is more commonly known. support the timely process for a Recall Referendum. As you can see from the links, dialogue with chavismo usually results in smashing successes. This is not to say, however, that we shouldn’t talk with the dictatorship. What it means is that we should do it knowing full well it’s a diversionary tactic, and realizing nothing will come of it. The government now faces a similar situation as it did in 2003. It is deeply unpopular and has little room to maneuver. The only reason it needs to appear interested in talking is because it has no other choice. Talking about dialogue means newspapers, TV shows, and politicians will have less time to talk about other things such as crime, scarcity, or blackouts. So my advice to the opposition is: play along. Don’t fall off message. Set your conditions. And don’t pretend like this is anything but theater. H/T: Thanks to Iruña for maintaining the document database.